This is my favorite Stylo restyle so far. I've made both of these patterns before so I'll spare you the pattern review (Clover Review, Mara Review). Suffice it to say I wouldn't have made a second Mara and a third Clover if I didn't like the patterns. I've had a chambray Mara in mind since I made the first one back in August. 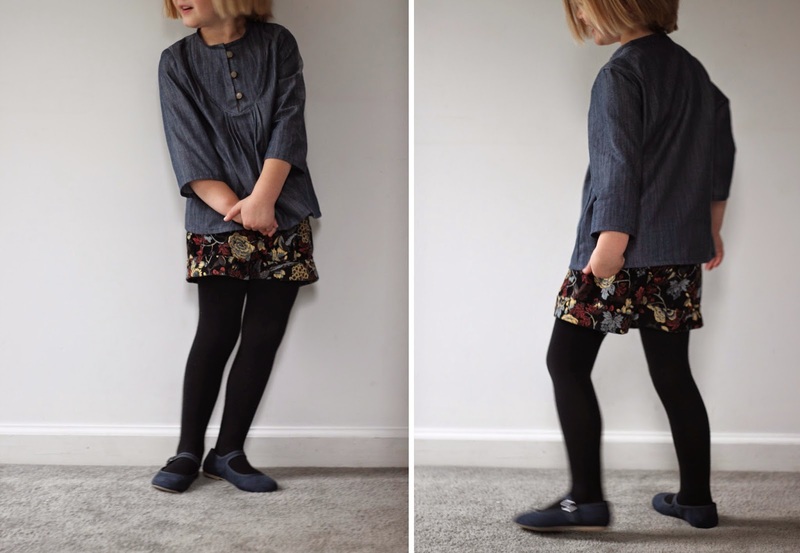 The weight of this beautiful chambray is perfect for an autumn top, and the subtle texture perfectly compliments the shade in the corduroy print. I got this lovely specimen at Home Made when I was "down the shore" (as the locals say) this summer. This is one of the best local sewing shops I've ever been to. Its tiny, but there isn't a single fabric there that I wouldn't love to have. I think this is the Robert Kaufman Union Chambray in Indigo, but I'm not certain, and I'm desperate for more. Winter is coming and my chambray stockpile is running low. Our last Mara was a 5 and it seems a smidgen on the snug side, so this time I made a 6. I omitted the piping because it seemed unnecessary without a contrasting fabric. Now that I've done it I think it might have sharpened the construction even without the contrasting fabric. 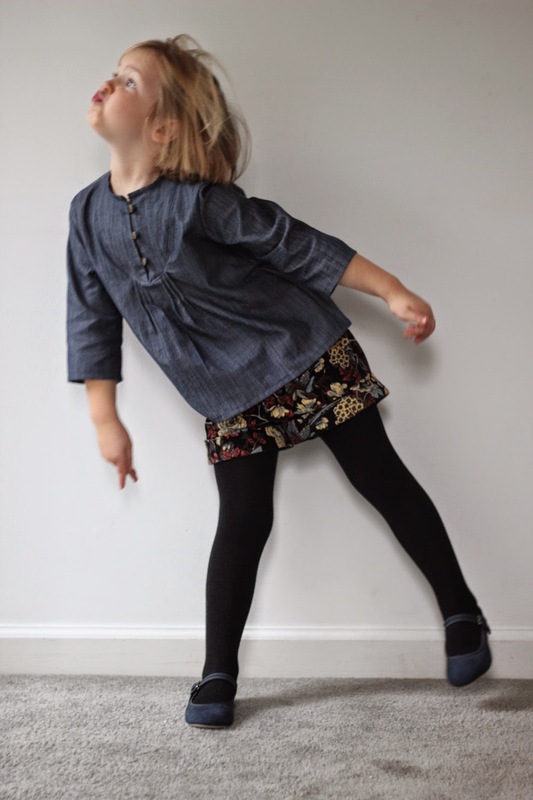 The 3/4 length sleeves are from the Louisa Dress (also by Compagnie M). The sleeves are meant to be interchangeable, but if you don't have the Louisa pattern, I think it would be pretty easy to just shorten the long sleeve piece included with the Mara. The shorts are a corduroy fabric only a middle aged woman could love (given that today is my thirty-very-much-something birthday maybe I should cut out the name calling). Yet something propelled me to pay the BF Bridge toll a second time to go back to Joann and get it (not great sign about my age!). It's not something I would normally buy, but in this limited quantity it really works. Shorts Fabric: Printed Corduroy fron Joann Fabric. So adorable! Such a wonderful collection of knitting patterns on this site as well! This thirty-very-much-something mom loves that corduroy too! Happy birthday! I love the Mara blouse in this chambray ~ I love the whole outfit! a simply amazing outfit! 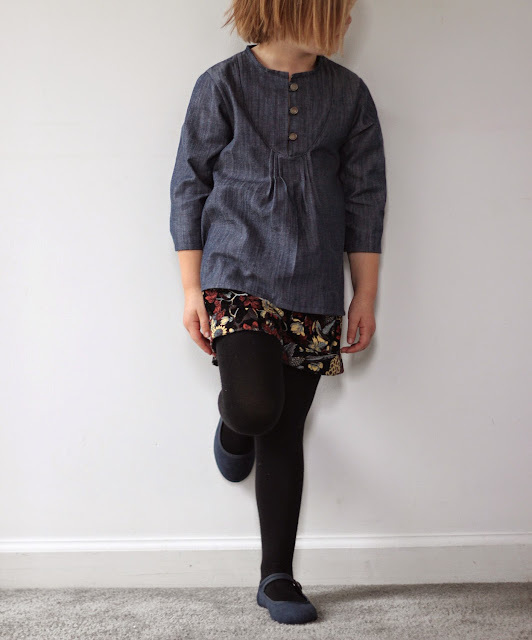 I think your chambray mara is my favorite one I've seen in the blog-o-sphere. Love how the simplicity of the chambray really makes the details stand out. And great pairing with the corduroy shorts! Thanks Lucinda. I love it too. If I could pull off those shorts I'd make myself this outfit! Hmmm...maybe a mini skirt version for mom?! Your first version of Mara was my favourite and now...! This is gorgeous. Did you add any length to this version? I didn't add any length, though I did make it a size bigger than her measurements. I loved her last Mara, but she out grew it in an instant. Kids grow to fast not to sew a size up! One reason or the other I missed this adorable Mara blouse! Today I was trying to gather the most beautiful Compagnie M. creations and just discovered this version. Gorgeous!